Few of the mountain ranges we saw or traversed were actually purple but all were majestic. 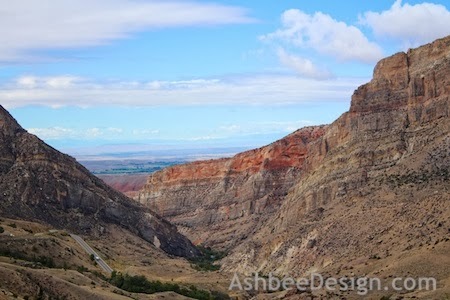 The view below is the road winding its way out of the Bighorn Mountains in Wyoming. The drive between Sheridan and Greybull was a beautiful one. Leaving the Big Horn Mountains in Wyoming. 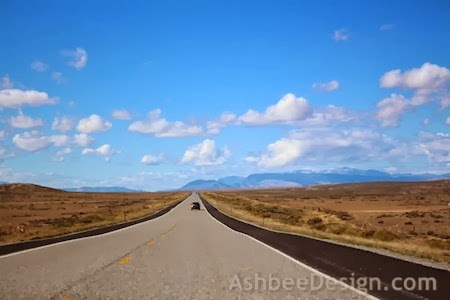 But the road on straightened out and we headed onto Cody, Wyoming. When the views were as expansive as this one, we often had mountains in the distance. Heading into Cody, Wyoming. Yes, those would be the Rockies and Yellowstone ahead. 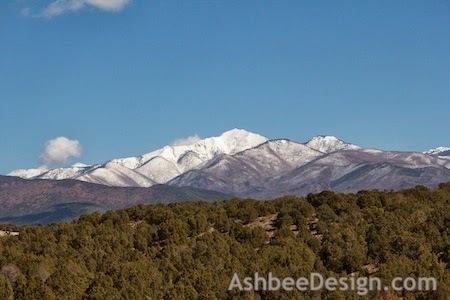 Snow was visible on many peaks as we headed into the Rockies in late September. 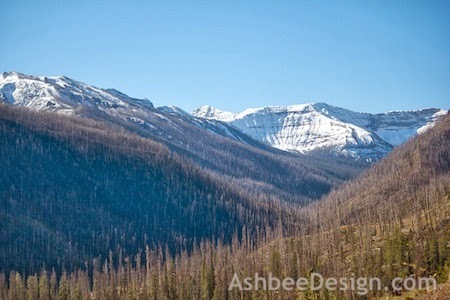 This is the east entrance into Yellowstone National Park and the pine trees have been ravaged by beetle kill. That combined with fire damage made the east entrance noteworthy. Other areas of the park showed amazing new growth from earlier forest fires. Especially beautiful was the growth in the area of the huge 1988 fire. Mountain view on the road to Yellowstone East Gate. Yellowstone is such a collection of amazing and different landscapes, some definitely other worldly and some just simply stunning. 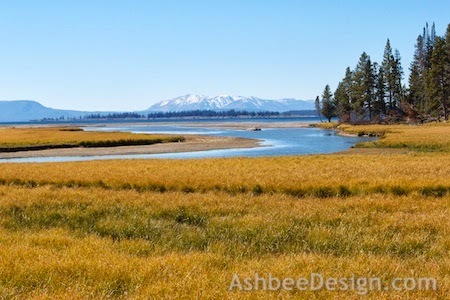 Here is a beautiful view south toward the Tetons across Yellowstone Lake. The Tetons as viewed from Yellowstone Lake. We crossed Washington State and into Seattle through clearing storms. 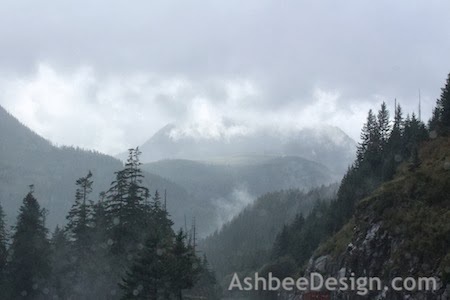 The pass through the Cascades was dramatic with lifting clouds. A huge mountain standing alone is an impressive sight. 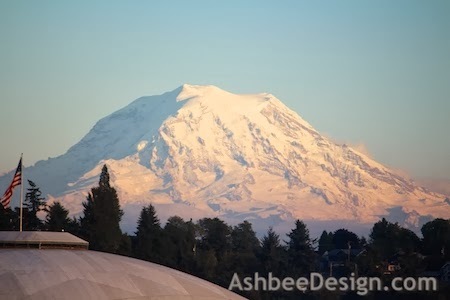 This was the view from our hotel in Tacoma Washington. We got to watch the sunset on the face of Mt. Rainier. We didn't get to see either Mt. Hood or Mt St. Helen because of storm clouds. 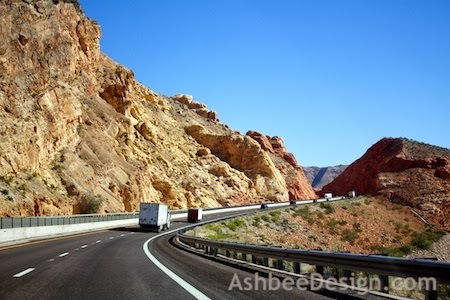 After Washington State, we headed south along the coasts of Oregon and California swinging back toward the mountains (and home) through Nevada, Arizona and Utah. You can see why we didn't tire of driving. The views like this were constantly changing but always beautiful. The engineering of the roads through the mountains was amazing. The curves were banked and you could just glide right into them, climbing for miles and then descending as you would weave through the ridges on the other side. 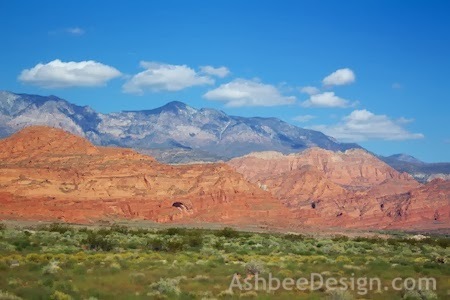 We thought I-15 and I-70 through Utah should be a National Park Corridor. The views were endlessly beautiful. As I said earlier, we took 6000 photos. And many are from the state of Utah! 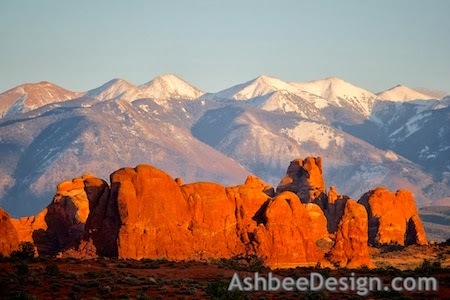 The mountains served as a beautiful backdrop to many of our photos in Arches National Park. 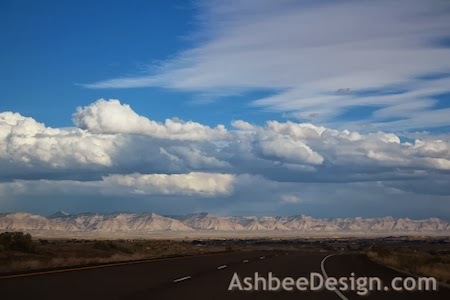 After Arches National Park, we continued east on I-70 into Colorado and were greeted by the western front range of the Rockies at Grand Junction. They looked white in the late day sun. Heading into Grand Junction, CO.
And then we unsuccessfully tried to out run snow in the Rockies. 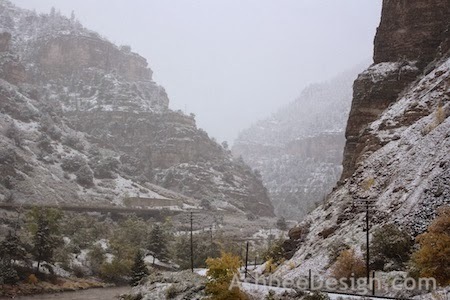 Our views through Glenwood Canyon were limited. Spectacular mountain canyons but no peaks. Luckily the temperatures rose as we climbed up into Vail and although it was still snowing, the roads were only wet and we were able to clear the passes with little problem. 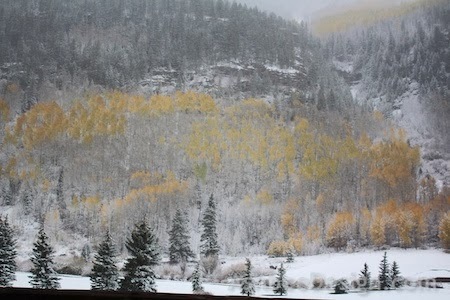 Vail, Colorado during a fall snow storm. 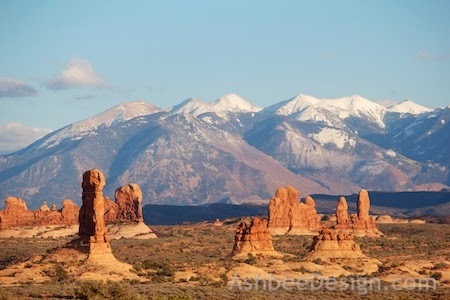 Awesome photos…the colours are amazing and the size of those mountains amazing. Thanks so much for sharing these photos. Beautiful! I feel like I haven't seen a lot of these. The Tetons over Yellowstone lake look like a post card.